Succeeding Online: What Does It Take? Wondering what it takes to find success? What the essential tried and true keys to succeeding online are? Even if you’ve been in the internet marketing game for a while learning, and putting into action, these six keys will help you find the success you’re looking for. Of all the questions I am asked, there is one that stands out above the rest. What are the real keys to succeeding online? That’s a good question, and one that deserves an honest answer. Before I share my answer, let me share this. I truly believe that anyone, anywhere, can succeed online if they do three things. Understand the difference between building a business and making short term money. Set goals that are big but achievable and are patient. Follow a proven process and avoid just do what I do products. 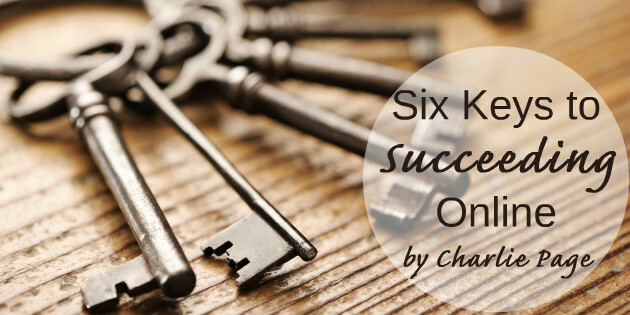 With that foundation, here are six keys to succeeding online in my view. What follows is based on my own experience. The experience of going from having $17 in the bank to where I am today. The experience of serving over 21,000 paying members. The experience of prospering in spite of illness. I hope what follows means as much to you and your family as it has to mine. Notice that sequence, because it is very important. Much more about these topics soon. For now, here are the keys to succeeding online in my view. Many people don’t take the time to think about which business model they will adopt before trying to make money online. But this choice is a vital one. You would not borrow $100,000 to start an offline business and not care which business you started. If you risked your life savings, or went into debt, you would be sure to know just what you were doing, and how you were going to do it. There is no difference with an online business. When starting out online you need to know what your business will be about. Will you be an affiliate, selling other peoples’ products? Will you be a product creator, creating a book or membership site? Will you be an expert, creating or curating a site about one specific topic? Will you be a service provider, providing services (like building websites) for others? These are only few of the business models that work very well online. Have you chosen your business model yet? If not, today is the day to start. We all suffer from shiny object syndrome. I’ve been there too. This new offer sounds so good you just have to click the link to learn more. We have all done it. Some of us many, many times. But when we do we lose sight of an important fact – there are only 24 hours in our day. And our time needs to be spent building our business not drooling over the latest and greatest “dime sale” that you know won’t work but will contain three or four upsells. Again, not throwing stones here. I do it too. A wise person once said that success was more “about saying no than saying yes.” It’s true. If you want to say yes to your own success it will be vital to develop laser-focus on what you need to do today and leave those shiny objects behind. Commitment is a commodity in short supply these days. If “what are the real keys” is the #1 question I hear then this statement is the #1 problem I see. It’s true. No real business you join is going to provide instant success. It’s been said that it takes 10 years to become an overnight success. If you aren’t making money in the first few days or weeks of a new project, don’t lose heart. Sometimes it takes a bit of time to get the process down and to start generating income. It takes time to get your bearings, find the prospects, create a sales funnel, drive the traffic and get things going. The idea of joining a business (or website) and then counting on making quick money to pay for what you bought before the refund period is over is just never going to work. Choose a business you believe in. Make sure the business is viable. Make a commitment to learn before you earn. Set a goal and deadline for making progress. Evaluate your progress when the deadline comes. In my experience, that is not the real world. How do you find success online? Do you stick to a plan, following keys like these?